It was a beautiful Saturday and I was hanging at Gamestop with my cousin looking for a new game. I couldn’t find anything that grabbed my attention and having to leave shortly, I told my cousin to just pick something for me. 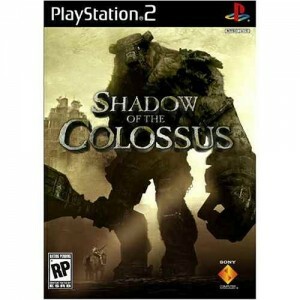 He grabbed Shadow of the Colossus (PS2) and said “This one.” I asked “Have you played before?” he said “No I just picked at random.” Little did I know that he had managed to pick the greatest game on the PS2 ever made at complete random. I brought it home and popped it in. The moment I saw the first colossus my jaw hit the floor. Shadow of the Colossus is amazing not because it’s a game, but because it’s an experience. The presentation is nothing short of a masterpiece, as it fills the player with a strong sense of wonder, mystique, loneliness, and danger. From the absolute wonder instilled by seeing one of those impressive colossi, to the relationship that you develop with your horse Agro, the only other “person” in the world, Shadow of the Colossus makes you feel things in a way you never knew a video game could. The colossi are so impressive and move so realistically that your mind can’t tell the difference. The world is beautiful and filled with birds and lizards, but feels like a land that no human has traversed in thousands of years. That fact isn’t just a piece of lore or story point. You really do feel like you’re exploring a long forgotten land. A long forgotten land that also happens to have dangerous, massive, giants hiding in its hills. This mix of loneliness and unsettling, looming, danger makes exploring exciting. I remember spending hours trying to climb up a cliffside just because the game has me thinking there could be something amazing up there. The day I made the climb up to the secret garden for the first time is still one of my most memorable gaming experiences. I think the most amazing part is that this was all done on a Playstation 2. Two consoles later, and still I don’t think anything has accomplished what Shadow of the Colossus did, at least not to the same level of efficacy. It is truly impossible to accurately put into words why Shadow of the Colossus is so moving. You just have to play it yourself to understand. Once you do, you’ll never look at video games the same way again. And that is why Shadow of the Colossus is one of my most favorite games of all time.